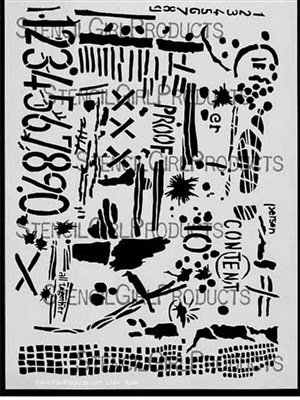 Please welcome StencilGirl Artist, Seth Apter, to the blog today!!! I am excited to be the guest blogger today and am starting this post with a thank you to the entire crew at StencilGirl Products. 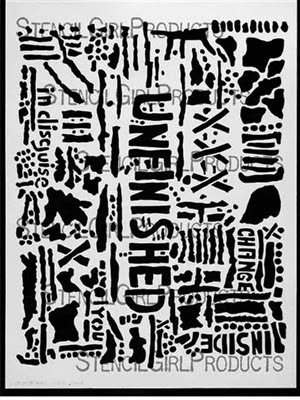 Even though my newest set of stencils were released just a few weeks ago, I decided to use my original set of stencils instead. Didn’t want them to feel left out! 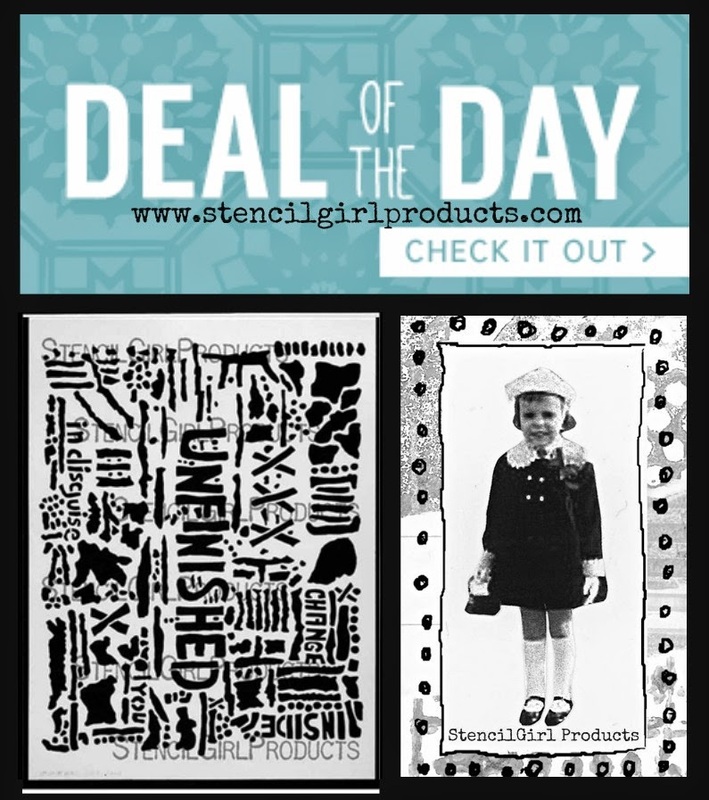 Unfinished is even the Deal of the Day TODAY over at StencilGirl Products! I started by gathering three sheets of decorative paper from Authentique, large enough in size to be able to handle the 9” x 12” stencils. A new favorite product, a texture spray called IrResistible from Imagine Crafts, were used to spray through the stencils. I used multiple colors to get a more mottled effect. What I love about this spray is the fact that it actually gives a textured and dimensional feel to the surface after it dries. I took all three stenciled papers and cut them into small, 1 3/8” squares using Spellbinders Media Mixage Squares Two die set. My aim in doing this was to reassemble the squares into a quilt-like mosaic as a background. I used a piece of watercolor paper that measured approximately 11 ½” x 8 ½” as the substrate. 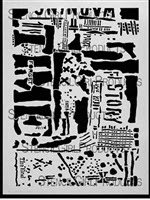 I like the look of the grid as a base and the stenciled images become even more abstract as a result. I adhered the die cut images to the mosaic grid background using adhesive. Here is a detailed shot to better see the layers being created. Next the fun really began. I dry brushed gesso over the entire surface to better blend the disparate elements. I then used the three stencils to add additional imagery and text over the background. This was done using acrylic paint and gesso, which were added by pouncing with a craft sponge, as well as black and white gel pens. The gel pens were also used to outline the die cut figures and to add my own hand drawn marks. For a final touch, the edge of the piece was inked using several colors of pigment ink. Another details shot for a closer view. Thanks so much for taking the time to read through the tutorial. My favorite part of this project was taking the stencils and the dies – both commercial products – and altering them in such a way that I could make them my own. To see more of my work, please visit my BLOG and my WEBSITE . 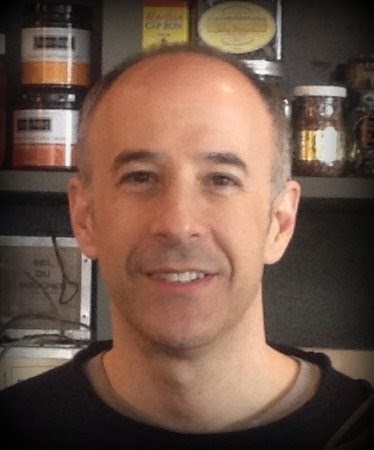 You can find links to my other social media sites there. Wow. You've done it again, Seth. A marvelous page. Great stencil, dies , colours and technique! This is a superb piece. Love the grid design. I love this Seth, you sure spread the joy in art making!!! Love this piece! I need to get me some of that texture spray, I haven't seen it before. Great job, Seth. Thanks for using irRESISTibles!